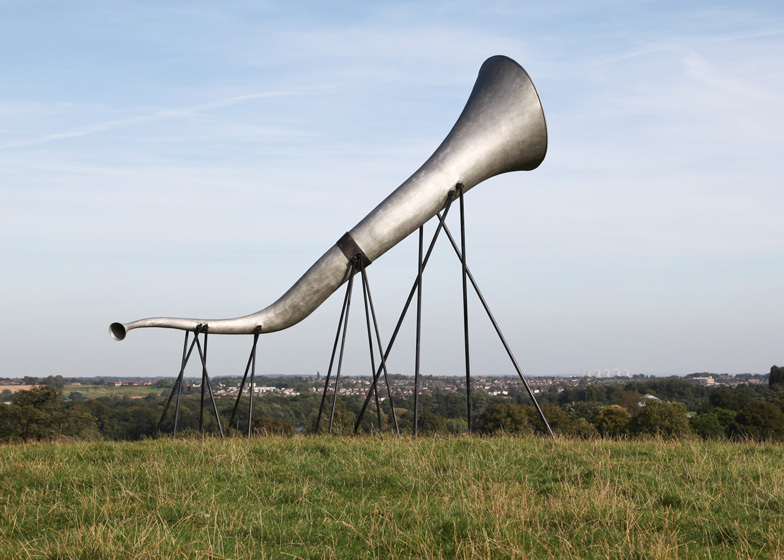 The sounds of the countryside are amplified when you place your ear towards one of these four enormous trumpets built by architects Studio Weave (+ slideshow). 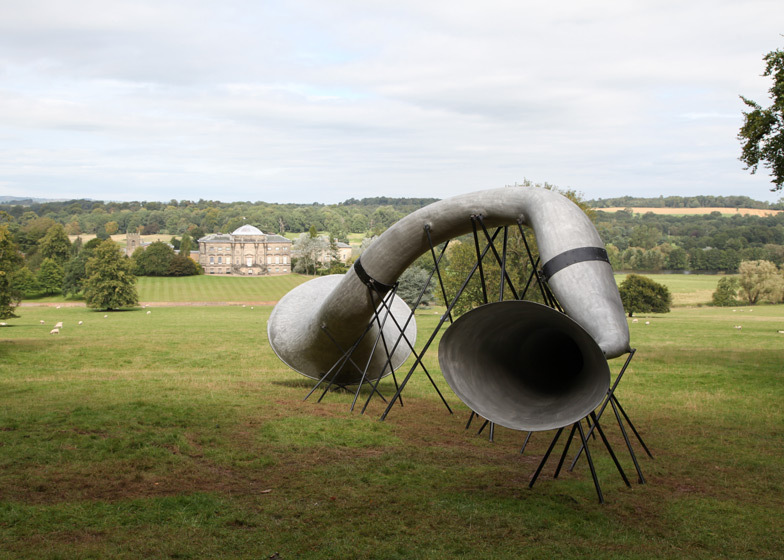 Named The Hear Heres, the horns are dotted along a walk through the grounds of Kedleston Hall, a stately home in Derbyshire, England. One horn is pointed down towards the surface of a lake (above), while another angles up towards the sky (below). 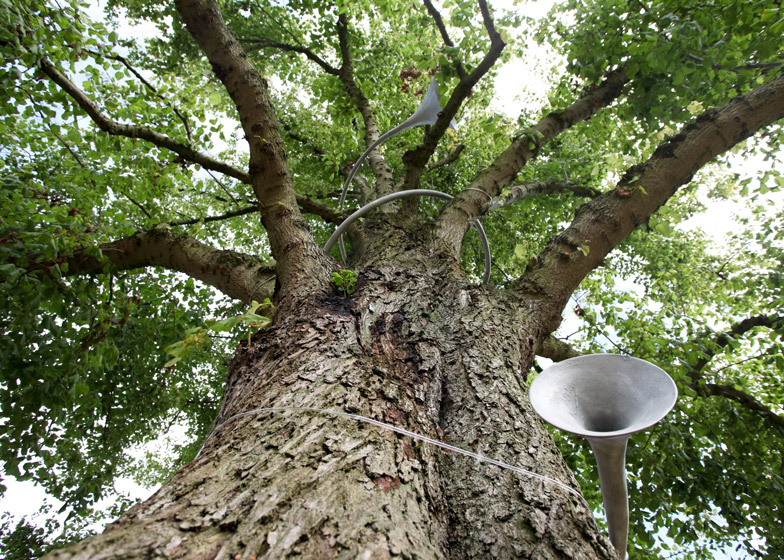 The third trumpet winds around the the trunk of a tree, so listeners can hear the movements of the branches (below). When describing the fourth and largest of the trumpets (below), Studio Weave's Maria Smith told Dezeen how "it's fun for two people to sing to each other from opposite ends." She explained how the sound is loud on one side, but "sounds distant" from the other. "We thought people would play and experiment with them," she said. Each trumpet is made from fibreglass and coated with zinc, and a set of metal struts holds each one in place. "The struts have metal plates welded to their bottoms and are staked into the ground, said Smith. "When The Hear Heres are removed, the ground will be left untouched." 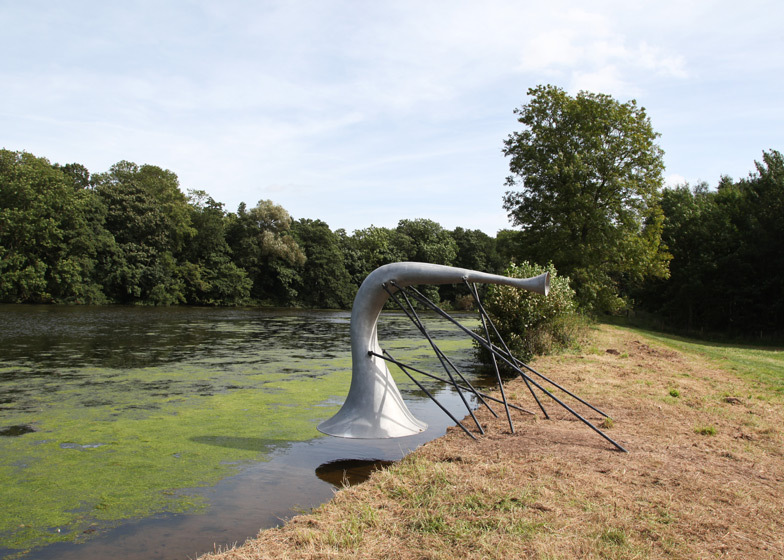 Other unusual projects by the Hackney-based architects include a floating cinema, a latticed timber hut on stilts and a 324 metre-long bench. We've also featured a couple of other listening installations on Dezeen, including a room in a shipping container and two riverside pavilions.